The following iced tea recipes are sure to keep you hydrated. A tall glass will perk you up and cool you down. Iced tea is the perfect drink for a hot day, or any day you desire a cold beverage! 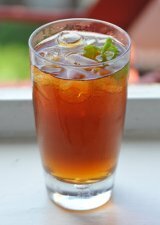 Why Make Iced Tea at Home? Making iced tea is quick and requires little effort. If you can measure water and sugar, turn on a stove, and count tea bags, then you can make iced tea. Iced tea is also one of the cheapest things you can make in your kitchen. Not only are the basic ingredients inexpensive and easy to find, they will last through numerous pitchers of tea. I love iced tea because it is cheap, hydrating, and hard to mess up. The recipes presented here are simple because I only do things in the kitchen that are simple. Also, true sweet tea is too sweet for me (despite my Southern roots). So my sweet tea recipes are light on the sugar. But if you or your guests prefer a sweeter tea, feel free to add more sugar to the recipes or keep simple syrup nearby. This iced tea is easy, delicious, and has only three ingredients: tea, water, and sugar (if desired). It is a basic and traditional way to make iced tea. Sun Tea uses heat from the sun instead of boiled water to brew the tea. It is a simple and cheap way to make tea without using any appliances. Add an extra zing to your iced tea! 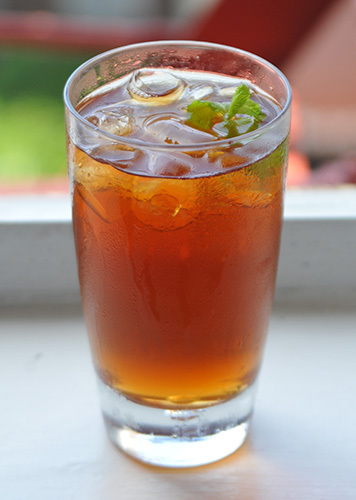 This simple yet delicious mint iced tea uses fresh mint to make a cold and refreshing brew. A flavored favorite, peach iced tea is hard to beat. The taste of peach makes it special and gives you a fun alternative to regular iced tea. This simple syrup recipe makes a super easy sweetener that can be added to iced tea that has already been made. Caution Pouring Hot Liquids into Glass! Have you ever broken a glass pitcher by pouring really hot water into it? I have and it stinks! You ruin a pitcher, lose all your tea, and then there's the danger of having broken glass everywhere! When the temperature of the glass changes very rapidly it can experience thermal shock and break. So allow your tea to cool down some before dumping it into a glass container.